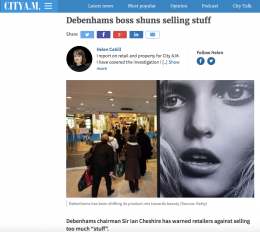 Speaking at the World Retail Congress in Dubai this week, Debenhams chairman Sir Ian Cheshire told delegates to avoid focusing too much on selling "stuff" and instead urged them to offer consumers, in particular millennials, great experiences, rather than just selling goods. Pointing to Apple stores as an example of the kind of retail experience younger consumers expect, he said, according to City AM: "The next generation is behaving differently, spending differently and interacting differently". This would have been a very good point to make, were it not for the fact that Sir Ian has made one very big mistake: to assume that because Millennials are buying less "stuff" that it is they who are driving the shift to consuming "experiences". In fact, they aren't. The problem for Sir Ian's theory is that, according to ConsumerCast figures, not only are millennials not buying more stuff — clothing and footwear, household goods etc. X — but they are also cutting back on other areas as well. So recreation and culture spending by under-30s households, covering everything from package holidays to gym memberships and hobbies, was actually 10% lower in 2016 than it was five years before, while expenditure on restaurants and hotels grew by just 3.4% over that period. Unfortunately for the millennials (and for retailers hoping to target their spend), the big growth areas in their budgets are housing and education, not "experiences", other than the experience of having a roof over their heads and student loans to pay off. Contrast that with the over-50s, who may be spending more on goods, but are also splashing out to an even greater extent on experiences. They have driven 96% of all growth in recreation and culture spending since 2011, with 59% accounted for by the 65+ audience alone, and three quarters of the increase in restaurants and hotels. The message about the shift to the "experience economy" is very clear: in terms of spending power, the millennial market is a mere side-show compared with the big-hitter consumers, the over-50s.